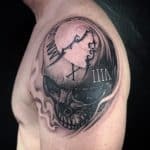 As the world of tattoos continues to evolve and become more sophisticated, tattoos are no longer just cliché drawings of anchors or consist of rough, nondescript designs. These days, people like to ink themselves with increasingly elaborate and complex artwork that expresses their innermost feelings and beliefs. These tattoos are often connected to religious beliefs, and the chief amongst these is the depiction of Angels. Inking an angel is a popular way for people to demonstrate their belief and love in their God, their religion, or their philosophy. While acknowledging that both men and women like to have angels tattoos inked on their bodies, there is little doubt that through the years, angel tattoos have become a particularly ripe domain for the male of the species. Quite why, who can say? But there are certainly many good reasons why men are often attracted to the idea of having an angel or two on their bodies. Firstly, it is important to note that angels are to be found in many of the world’s religions, including Christian, Jewish, and Moslem. The Christian and Jewish bibles and also the Quran mention angels as God’s messenger. Indeed, the word ‘Angel’ is taken from the Latin word angelus which means messenger. In effect, angels are God’s messengers between heaven and Earth – a servant of God. Religious angels are regarded as protectors and guides and represent many different emotions and feelings. Angels help us get through the lows of life such as pain, suffering, negativity, sorrow, and remembrance. They can also uplift our feelings, and help us to rise above our failures and life’s troubles and succeed in our ideals. People believe that angels can guide us to great accomplishments. Angels are also symbols of purity, beauty, gentleness, and kindness, and can protect us from accidents and physical danger and guide us away from negative and evil thoughts. 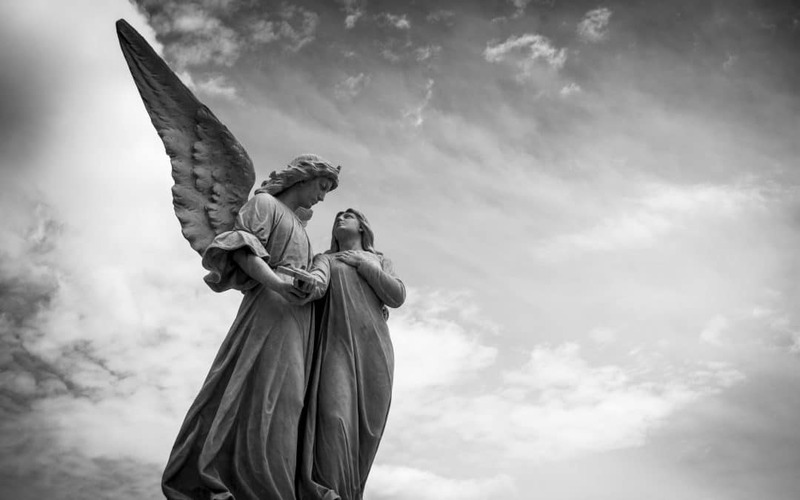 Thus it can be seen that angels are not only the preserve of religious people but are really open to anyone who believes that there are inherent powers of protection embodied in an angel. It has been reported that as many as 80% of Americans believe in angels. There are others who simply like the idea of having a magical, mystical creature inked permanently on their body and also those who have angels inked, purely for their aesthetic and artistic qualities – something wonderful to look at. The most important facet of most angel tattoos is its wings. Although the bible describes Cherubs and Seraphims as having wings, there is no actual mention of angels having wings. But early artists portrayed angels as having a human-like form with wings and the image has remained so throughout the centuries. Some angels have huge, wide-open wings, others have fallen or broken wings and a few angel depictions have no wings at all. But for a majority of angel tattoos, wings are a key integral component. Traditional holy angels are usually shown as good looking, or beautiful human-like figures with large open wings. Such a creature is regarded as a symbol of the good news from God and the open wings represents a faith and a belief in God. Guardian angels typically protect the wearer from pain and evil. It is believed that they never leave us and are even with us when we die to guide us into the next life. Guardian angels for men are usually depicted as a human-like figure with a glow or light around him, looking down on the wearer or looking to the side as a signal of protection. Guardian angels are often shown holding a sword and a shield for protection. Also known as The Grim Reaper, the Angel of Death is the darkest of dark angels, representing death and evil. While the figure of the Grim Reaper is usually depicted without wings, the Death Angel is typically shown as a scary creature with exotic wings. Fallen angels are believed to be angels who have been banished from heaven. The most famous of these is Satan, or the devil, thrown out of the pearly gates for committing the grievous sin of pride. Satan is typically shown as a dragon-like creature with red skin and surrounded by flames, while other, lesser-fallen angels, are shown as male figures with wings who look very sorrowful and full of shame. They are also often shown as looking upwards, towards their goal of getting back into heaven. We have all seen pictures of cute babies with wings, which are commonly regarded as cherubs or cherubims – which according to medieval angelology (yes, there is such an ‘ology’), are the second of the nine orders of angels. Of course, cherubs are not as popular with men as the grown-up angels, but you will still occasionally see them inked on masculine bodies. Where are most popular places for men to place their angels? Well, both figuratively and literally, angels need space to spread their wings. Like any tattoo, angels can be inked anywhere on the body, but by far the two most commonly used places are the arm and the back. You can see many tattoos of angels that start at the lower shoulder and/or upper arm, and spread right down to the elbow or even further with the wings wrapping themselves around the arm. Some angel tattoos cover the whole length of the arm, right down to the wrist. You can also see them on the inside of the arm, spreading down to the wrist. The second most popular position is on the center of the upper back, spreading down to the middle back. The back is a great canvas and the wings can spread right across to the shoulders. A variation on the central back placement is to ink a smaller angel on one-half of the upper back, with another tattoo, such as a cross, on the other half. Where to get your angel tattoos? An angel tattoo is a major piece of art. 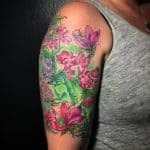 It is absolutely essential that you find the very best tattoo artist available, or you may end up with having to live the rest of your life with a bad piece of art on your arm or back. Check the studio and artist out carefully; check their reputations and make sure the studio is using the latest techniques and is clean and hygienic – you don’t want any accidents or bad endings with a tattoo of this size. 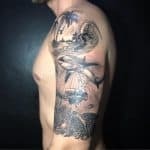 If you come to ALL DAY Tattoo in Bangkok, you can be sure in the knowledge that our internationally renowned and expert artists will do a great and safe job for you. 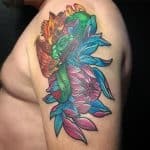 We, at ALL DAY Tattoo, have some of the finest artists in Asia and we can create a unique and beautiful work of art. Our artists at ALL DAY Tattoo will discuss your ‘angel options’ and show you how they will look on your body before we start the work. As always, we are happy to consult with you about your design ideas – or discuss any other tattoo ideas you may have. Our consultations are free of a charge and there is no obligation for you to proceed with the work. Why not click the button below to arrange an appointment and see what we have to offer. Our artists at ALL DAY Tattoo are awaiting your message. Do Women Prefer Men With Tattoos?